How does 'my theory' fit with the evolution of insects? I knew that the dominant soil animals are more 'primitive' than insects - evolutionarily speaking - but how does insect evolution fit with the evolution of soil? It is said that the evolution from primitive wingless insects to winged insects is pretty well known. (Tree of Life). However, here I talk about the evolution of primitive non-insects into flying forms - many insects. The great explosion of insect types was in the Carboniferous period - the period immediately following when I say soil creation occurred. Insects are classified according to their wings - in other words, their key character is that of flight. They took to the air. All types of insects are classed according their wings, or 'ptera'. Lepidoptera - moth and butterflies, are classed by their s'scaly' wings - Lepidoptera. Flies are 'diptera - because they only have two wings rather than the more normal four. Beetles are Coleoptera - 'hard' wings that cover flying wings. I thought insects may have first come out of the water - e.g. dragonflies are very ancient. But it seems they came out of the soil. Insects like dragonflies and mayflies, diving beetles, went back to the water. Dragonflies evolved around 325-330mya - well after my soil theory. While I had thought that perhaps insects emerged and evolved from water on to 'the land', it seems it is the other way round - that they evolved from soil, from soil creatures. Recent major research carried out by 100 collaborators from 10 countries "clarifies insect evolutionary history. It shows that insects started flying 400 million years ago, long before any other animal, and at nearly the same time land plants first grew substantially upwards to form forests." Whenever you see in evolutionary theory 'started' or 'first specimen' you have to take into account that this is NOT the main explosion of numbers, which usually occurs some time later. So it fits quite well. More primitive insects are called 'hemi-metabolic - going through various growing stages, each a bit more developed There may be several or quite numerous stages of 'nymphs'. All soil animals - both springtails and mites, just go through a series of nymphal stages before maturing. More advanced insects have a complete metabolic development. This where the series of growth stages are quite distinct. The most obvious are butterflies bursting from a pupa that followed the caterpillar stage hatching from eggs. But this form of development is a good 100 million years later, So we can expect the more primitive insects, like earwigs, to have a series of nymphs - like the soil animals. According to Tim Cockerill, talking with Brain Cox, metamorphosis is probably one of the reasons insects have become so successful. The four most diverse groups of animals on the planet - wasps, beetles, flies and moths, all do it. the most important things for species to survive is to eat and to reproduce. These creatures have one half of their life cycle designed - by natural selection, to take on as much food as possible. The larvae is an eating machine. The adult is there to disperse, mate and lay eggs. If my theory is right about insects evolving from soil animals, then they come back to the soil for their larvae stage in many of them - eg leatherjackets for craneflies, and chafer grubs for cockchafer beetles. Did apterygotes gave rise to insects? It seems that colonisation and creation of the soil took place by creatures that dominated the soil, that then evolved into insects - characterised by taking to the air. We need to look at apterygotic arthropods (ones with out wings) and try and work how these may have evolved wings. According to 'The Terrestrial Invasion, the apterygotes- Diplura, Protura and Collembola (that until relatively recently were considered insects), along with Symphyla, all developed similar adaptations in movement from marine to 'land'. We have seen them all play vital roles in the soil. Is it likely that these creatures were the ancestors of insects? Without them colonising and creating soil, where would insects have come from? Probably the best book on insect evolution - Grimaldi & Engels, says "Early terrestrial tracks document the presence of various arthropod lineages and support the view that insects themselves originated in a terrestrial environment. It is interesting to note that the arthropods comprised the earliest know terrestrial animals." Grimaldi & Engels Chapter 3 p.110 They confirm that the creatures that are the progenitors of insects are springtails, protura and symphylans - but they see them as part of 'Invasion of the land' rather than the formation of the soil. See what I think of that 'Invasion of the land ideas'. .According to Chapter 3, 'Arthropods and Insect evolution', track their evolution up to the time of insect evolution proper, they have sub head 'Invasion of the land'. They identify the apterygota but give no explanation of their role, either in the soil or in how they may have changed to evolve into insects. Springtails - often found in pools and ponds would have sprung onto the land and there developed their relation with plants, which we have seen elsewhere on Birth of the Earh. They found new role, eating root debris, and fungal debris. keeping the plants health and their role with fungi bringing in nutrients - in the first place from volcanic ash dust. As time went on, they have moved further down the deepening soil, loosing their 'springtail' (furca) as no using springing when surrounded by soil. Their distinct character - collophore - is 'sticky', and is presumably how fungal spores get stuck on them move around the soil. But why do the collembola have it these organs perhaps picking up spores from the sporohore in order to be fertislised. There is no internal fertiisation, as with insects. Oh bugger! !.why not? Does that imply they all came through Thysanura - silverfish..or somewhere else? Then there is this.. recent major research "answers many long held questions about the evolution of the world’s largest and most diverse group of animals’, explains Dr Bjoern von Reumont, at the Natural History Museum London and co-author on the paper. ‘It shows that insects are likely to have originated from a little-known group of venomous crustaceans called Remipedia. I collected the remipedes included in this study, cave diving in underwater cave systems on the Yucatan in Mexico.'". It may be the nearest he found..buit what other possible progenitors were included.I would find it surprising that there is only one progenitor. And I dont buy this - there are only a handful of living species, and a single fossil and the group was only determined 30 years ago. Others seem pretty certain that apterygotes are related to insects. The term apterygote came from Greek words meaning “without wings.” These are primitive, wingless insects and they hexapods which mean they have six legs. Some of them do not have eyes. Scientists believed that fossils found, occurred during the Devonian period that is 417-354 million years ago. that puts them in the right timeframe for making soil. They were classed as insects until 'recently' - Dividing Hexapods beween Entognatha (Collembola and Dipurans) - internal mandibles and Ectognatha - Insects was suggested over a 100 years ago by Grassai but really defined by Hennig in the around the 1960's and 1970s. Ephmeroptera = Mayflies, insects, Odonata = Dragonflies, also insects. According to this diagram, the apterygotes became silverfish which evolved into insects. However it was not until the primitive hexapods had helped create and colonise the soil, was there the development of insects, as they took to colonise the new space above the soil - the air. Cockroaches have been around for a very long time -Ancient cockroaches looked very much like this modern one, Macropanesthia rhinoceros. © Natural History Museum, London. From the Encyclopedia of Life. The Carboniferous, around 300 million years ago, is sometimes called the Age of Cockroaches because insects broadly resembling modern roaches flourished during that era. That follows the period I'm talking about..From over 330 mya this cockroach like creature. 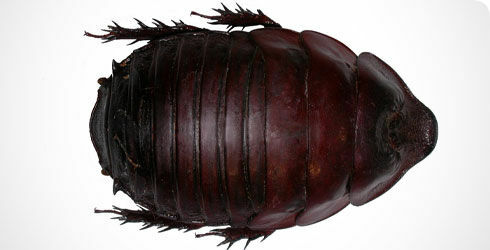 There were 'roachoids' before cockies..
From same time, see this creature Anebros phrixos as a 3D rendering of 300+mya. It is called a 'nymph' but were they nymphs, or creatures that existed previously and evolved another stage in development later - with wings? Like this.. I think that different versions of insects arose at different times/places, but united with potential to colonise the air above the soil. It seems pretty obvious that it was the soil that was first created/colonised, and from there, the creatures took to the air - and needed wings to do it. Some insects have larval forms living in the soil. Did these insects with soil larvae (beetles, and flies) evolve out of the gorund, or did some some back to use the soil for larva? I've always thought the latter - but have no evidence. Otherwise you cant help but think diplura (earliest 350mya) to earwigs (around 200 mya) seems pretty feasible. Not all will be from soil..but good chance. Proturans live chiefly in soil, mosses, and leaf litter of moist temperate forests What insect type may they have become? Using four legs to walk - with exploratory pair - seems to be an resting possibility - that has not evolved further/. , symphyla are translucent, and only distantly related to true centipedes. They have several features linking them to early insects, such as a labium (fused second maxillae), an identical number of head segments and certain features of their legs. and Symphyla. Molecular studies show conflicting results, with some supporting the Progoneata clade, others centipedes. A myriapod is the earliest known terrestrial animal - found from around 400 mya. Perhaps a page on Extinction.. There was one of the big five extinctions in 356 mya, that seems to have stopped the movement of fish to land - were four footed fish on river/sea banks before that..but how does it impact on land colonisation or as I call it soil formation?